I fiddle around with tomato sauces. I was proud to make a rough, workhorse pasta sauce in college that could easily accommodate whatever I threw in (kalamata olives, bits of ground meat, fennel, etc) and still be done in 45 minutes. The secret was to cook the sauce in a giant skillet, so the water rapidly steamed off in the expanded surface area to thickened the sauce. My sister Becca makes a religion out of pasta sauces, growing up with the idea that they should cook all day while you hang homemade pasta over the backs of chairs. A coworker of mine used to buy a $5 pint of tripe in marinara from an Italian deli everyday he was at work. It was really good. Tender and zesty, without any of the "wet dog" aroma I had heard of tripe. Most tripe recipes I knew had the stomach served in a pale broth or flabby cream sauce, and never really sounded appetizing. But those pints of tripe were inspiring - richly flavored marinara sauce adding bold flavor to an otherwise neutral (if not unpopular) cut of meat. I love pasta, but I will be honest in saying I have no overarching desire to cook pasta sauce all day. It's irrational. I can poke and stir a pot of stock for the better part of a day, but pasta sauce doesn't hold that inspirational drive for me. 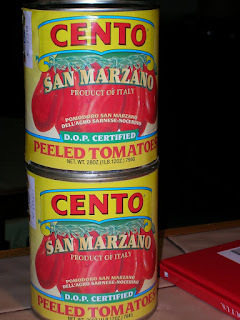 With my prejudice now before you, oh gentle reader, I'll tell you of the joy of San Marzano tomatoes. San Marzano tomatoes are a specific breed of Roma tomatoes. They are a name-controlled product, like the French A.O.C. cheese Comte coming from the region of Comte or Italian D.O.P. Tuscan Olive Oil coming from, well, Tuscany. They also cost $3.50 for a 28 oz can, compared to the $1.09 cans I've been buying. These government-regulated tomata's are grown around Mt. Vesuvius, which is known for it's rich soil. As a cultivar, San Marzanos have less seeds, which is where tomatoes draw their acidity. The result is a sweet, intensely flavored tomato from a can that tastes better than most fresh supermarket tomatoes. 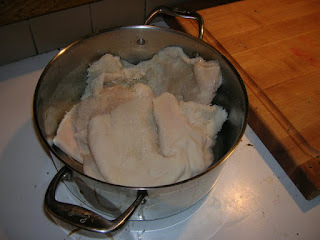 So I slapped down $7 for two cans of government tomatoes and grabbed three pounds of $1.49/lb tripe. These tomatoes were so flavorful, I would have been happy to just puree them and serve them as is. But cooked down for an hour with a blend of sauteed mire poix, this sauce was heavenly. The tripe, however, was nothing but an earthly product. Smelling of something vaguely familiar and mammalian, I tossed it in a stock pot of water and brought it to a boil. As soon as it boiled, proteins coagulated on top of the water in what cooks lovingly call "the scum." I tossed all this water out and refilled it fresh, which is actually a pretty normal step when dealing with lots of bones or odd bits you're condensing for stock. This also helps with the "wet dog" smell. I gently simmered it for two hours, then diced it and rinsed the tripe. 1.) I cooked it too fast and too hot. Shortly before cooking the tripe, I read a recipe for trip where the cook went too "low and slow" and turned it into mush. So I think I over compensated. Even though I turned it to a soft simmer, I should have probably stashed it in the oven around 300 F. 2.) I cooked it in the wrong manner. I wanted honeycomb tripe (from the second, third, and fourth stomach of the cow), but all they had was scalded tripe (from the first stomach). I should have probably researched more on how differently these two types of tripe would behave in the oven. One saving grace is that I still have a big pot of tomato sauce that would probably make Becca proud! mmmmmmmmmmmm . . . . we just had some great tomato sauce last night. I can never go back to canned 'ragu' style pasta sauce again!